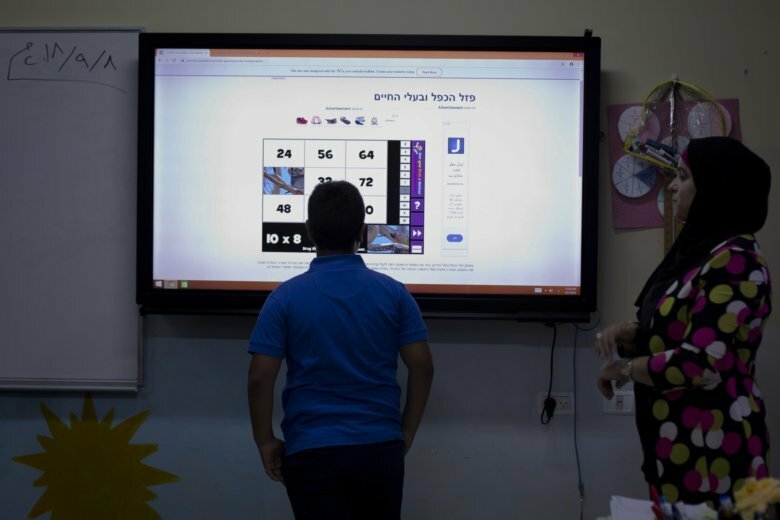 RAMALLAH, West Bank (AP) — As the teacher pointed to the large touch screen, her first-grade classroom came alive. With the click of a link, an animated character popped up on the screen, singing and dancing as it taught the children how to read. The day’s lesson was the Arabic letter “Raa,” and the screen displayed cartoon pictures of objects that contain the letter — desert, chair and pomegranate — as the teacher asked the children to come up with other words. The students smiled and sang along. Just a few years ago, such scenes were unthinkable in most Palestinian classrooms. Like elsewhere in the Arab world, schools in the Palestinian territories have traditionally emphasized memorization and obedience over critical thinking and creativity. With an eye to the future, some Palestinian educators now hope the use of technology and the arts will create new opportunities in a society that has produced large numbers of unemployed college graduates. Ziad Abu Ein is one of 54 “smart teaching schools” introduced last year. This year, the number tripled. By 2020, all 1,800 public schools in the West Bank are to be part of the program. Their teacher, Sawsan Abdat, said the children learned an important lesson that day — that they need to find what they are good at. After initial skepticism from parents last year, enrollment at the school has nearly doubled. This year’s first grade has nearly tripled to 43 students. These techniques are a radical departure from a system in which generations of students were forced to memorize information and cram for exams under the stern watch of an authoritarian teacher who in some cases would beat them with a stick if they could not complete their work. But with the unemployment rate for new college graduates hitting 56 percent, according to the Palestinian Statistics Bureau, officials realized that something had to change. Youth unemployment, particularly among university graduates, is a major problem across the Arab world. It was considered a driving force behind the Arab Spring revolutions that rocked the region in 2011. “Pressures on the region’s labor markets are rising. In the past five years, the region’s working-age population increased by 50.2 million, and 27.6 million people joined the labor force. Yet employment increased by only 25.4 million,” it said. The ministry said it is also trying to improve the level of instruction by increasing training and wages for teachers, building more classrooms and creating a more modern classroom through digital learning facilities. The government this year secured a $500 million loan from the World Bank to help fund the reforms. The region’s authoritarian governments might encourage education reforms as an economic necessity but could balk in the future at efforts to nurture a new generation versed in critical thinking. In the aftermath of the Arab Spring, governments in the region have increasingly stifled expression. Schools across the Arab world face other obstacles as well. A 2015 study by the U.N. culture and education agency UNESCO talked about chronic underfunding, a lack of qualified teachers and increased class sizes throughout the region. Syrian schools have been devastated by a seven-year civil war, while many schools in neighboring Lebanon have been overwhelmed by Syrian refugees. U.S. cuts in funding to the U.N. agency for Palestinian refugees have jeopardized the school year for some 500,000 students, most of them in the West Bank and Gaza Strip. And Israel’s half-century occupation of the West Bank, along with a decade-long blockade over Gaza, continues to stifle the Palestinian economy. She praised the changes taking place in Palestinian schools. Associated Press writers Sam Magdy in Cairo and Philip Issa in Beirut contributed to this report.